ATTENTION! To access add-on content, you must have The Escapists 2 game activated. Listen up Listen up Do not pass by: try to escape from the most fun prison in the world! In Big Top Breakout you will find everything you need for life in a circus: bells, whistles and splashing flowers. You have to serve the punishment in a traveling circus and earn a living by training lions, applying make-up and making animals from balls. And do not forget to come to the show to entertain circus visitors. In this strange prison you will find, create and use many new items to plan the grandest of all the shoots. Will you fly to freedom after a shot from a cannon, or will the strongmen spread custard tart on your face, and you will exist under the weight of guards and their sinister poodles for the rest of your life? 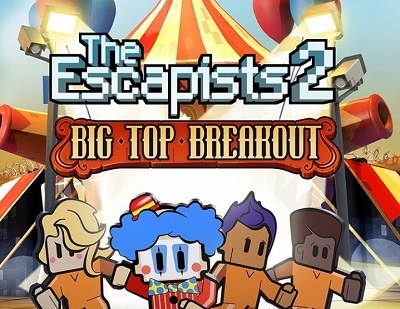 There is only one way to find out the truth: stop rolling a clown and load the Big Top Breakout prison!